The Chairman and Managing Director of Reliance Industries Limited, Mukesh Ambani, made an announcement about the current state of the Reliance Jio network as well as its future plans. He started off by saying that the company now has 100 million customers on its network in six months of launching. 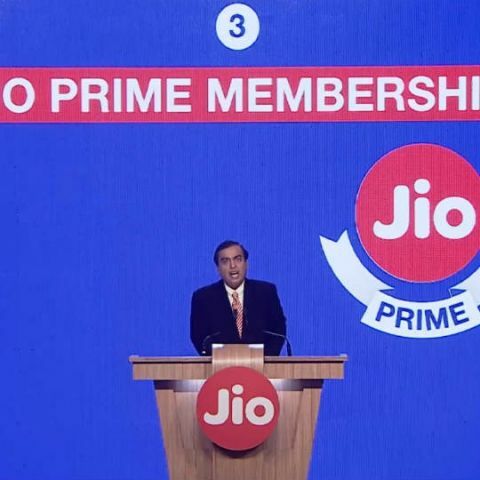 He noted that this meant that Jio was adding subscribers at the rate of seven every second. 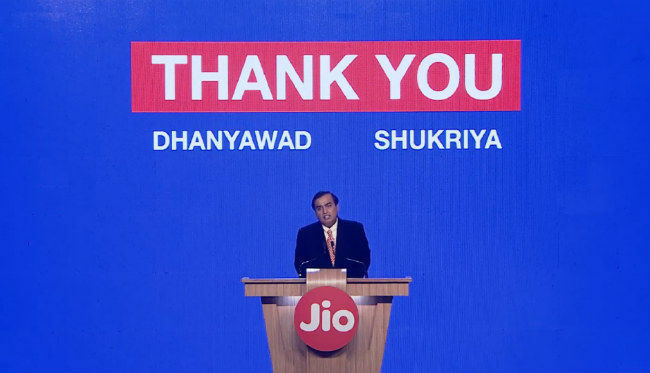 Ambani credited the achievement to Jio’s customers, employees, and other partners. “This record is an achievement of India and Indians,” he said. In his speech, Ambani said that before the arrival of Reliance Jio, India was placed 150th in broadband penetration. He said that after the launch of the Jio network, India became the number one country in the world for mobile data usage. He noted that Jio users consumed 100 crore GB of data a month, which was 50 per cent more than what China consumed and was approximately equal to the amount consumed by the US. 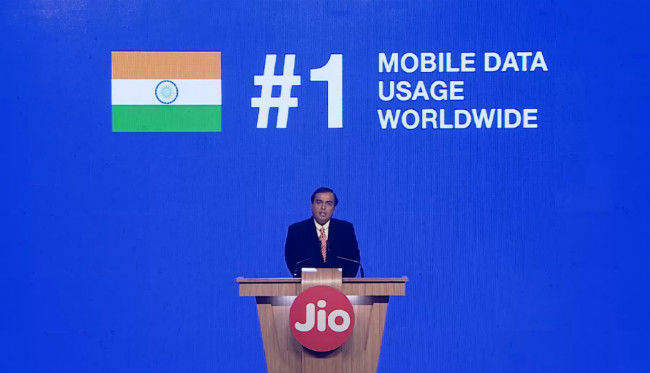 Further, he said that a significant portion of the data was consumed by video and that Jio had become the largest mobile video networks in the world globally. Ambani also said that 200 crore minutes of voice and video calls were made on the Jio Network everyday. 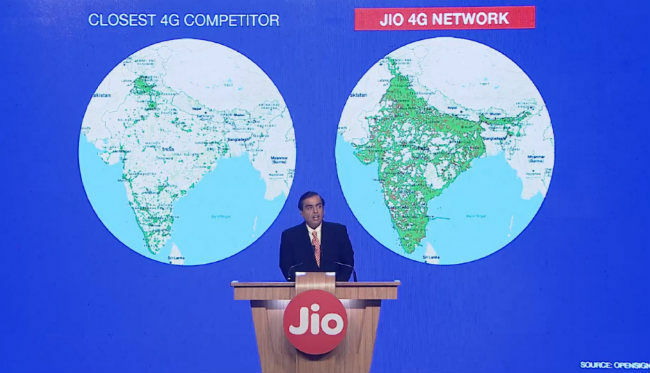 Speaking about Jio’s network coverage, Ambani said that the operator had twice the number of 4G base station as compared to all other telecom operators in the country combined. He also said that by the end of the year, Jio plans to reach every town, city and village in the country. Ambani then said that Jio’s Happy New Year offer will end on March 31 and will start its tariff plans from April 1, 2017. He reiterated Jio’s promise of not having any local, STD or roaming charges on its network. He also noted that other operators were also offering plans in order to compete with Jio, leading to an “anxiety” amongst customers. 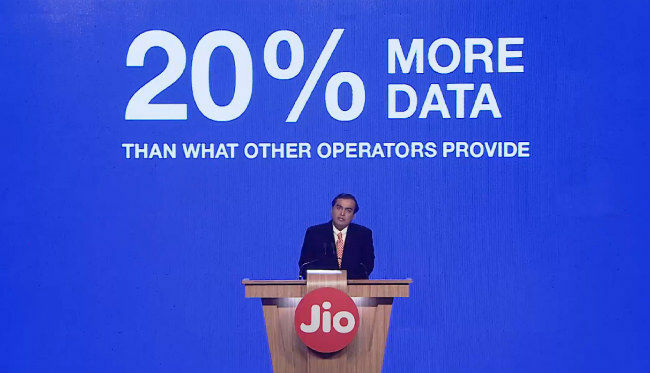 In order to stand out from the competitors, Ambani promised that Jio would monitor the plans of the other telecom operators, and offer 20% more data than them. 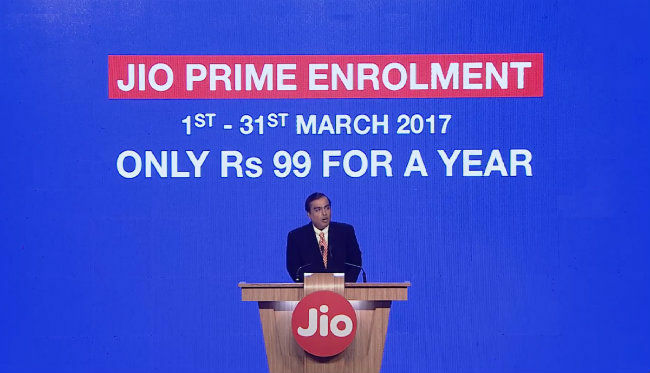 Ambani then introduced a new program called Prime Membership, which would allow subscribers to enjoy the same benefits as the Happy New Year offer till March 31, 2018. The membership is open to all the first 100 million suscribers as well as those to join before March 31, 2017 and costs Rs. 99 for a year to enroll. These subscribers can then pay Rs. 303 a month to enjoy the same benefits as the Happy New Year offer. Members will also get to use Jio’s entire suite of apps like JioTV, JioCinema and more for free till March 31, 2018. Jio subscribers who are are interested in enrolling for Prime Membership can do so via the MyJio app, Jio.com, and through retail stores.